The student should gain an understanding of departure and arrival procedures and clearances, as well as a basic ability to read enroute and approach charts. The lesson will be complete when the student can brief an approach, describe chart elements, and interpret air traffic control clearances with minimal instructor guidance. 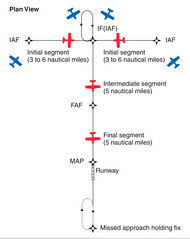 Published IFR departure procedure, providing a standard route from the terminal area to the en route system. To accept, the DP must be at least written down, and preferably in chart form. If not in possession, note “NO DP” in the flight plan. ATC might just read the whole thing anyway. Exist in vectored and pilot-navigated versions. Established IFR arrival routes for specific, larger airports, designed to simplify clearance delivery. Some procedures have mandatory speeds or crossing altitudes published, or information on what to expect. Aircraft on a STAR must be cleared to descend; obstacle clearance is the responsibility of ATC. Variations include RNAV and Type B, which use GPS or RNAV technology to attain 2nm and 1nm accuracy respectively. Different instrument approach types exist, with different arrival procedures, as many have multiple initial approach fixes. NOS and Jeppesen have slightly different formats, but differ only in minor symbology and the depiction of minimums. Missed (If missed, climb to 1,300 followed by a climbing right turn to 3,100 direct to RITTS and hold.) Mentioning fuel available for the hold is also a good idea.